Truman’s Amnesty International chapter and the Catholic Newman Center are sponsoring Death Penalty Awareness Week Sept. 9-14. The event is meant to raise awareness and dialogue about the death penalty as an American institution. A full slate of activities is in place to compliment the week of awareness. A panel discussion on the issues surrounding the death penalty occurs at 7 p.m. Sept. 12 in the Baldwin Hall Little Theatre. The movie “Redemption: The Stan Tookie Williams Story,” a Nobel Peace Prize nominee, highlighting the life of former Crips gang leader, Stan Tookie Williams, and his denouncement of gang violence, will be shown at 7 p.m. Sept. 13 in the Baldwin Hall Little Theatre. The week ends with keynote speaker Sister Helen Prejean, anti-death penalty advocate and author of “Dead Man Walking,” presenting at 7 p.m. Sept. 14 in Baldwin Auditorium. Sister Prejean, a New York Times best selling author and internationally recognized anti-death penalty advocate will speak on her experiences as a spiritual adviser to those on death row. All events are open to the public with no admission charged. Contact Elizabeth Hobbs, public relations chairwoman for Truman’s Amnesty International chapter, at erh350@truman.edu for more information. Truman State University social fraternities Delta Chi and Sigma Tau Gamma were honored recently with national and campus awards, respectively. At its national convention held this past summer in Cleveland, Ohio, Delta Chi received five national awards: The Official Certificate of Chapter Achievement, Most Outstanding Campus Leadership, Most Outstanding Ritual, Most Outstanding Web site and Most Outstanding Recruitment. According to Ray Galbreth, executive director of Delta Chi, the Truman chapter of Delta Chi is worthy of all of the recognition it has received. Sigma Tau Gamma, Truman’s oldest social fraternity, having been established in 1921, was the recipient of the 2005-2006 Interfraternity Council (IFC) Most Improved Chapter award. The IFC honors only one fraternity on campus with this award every year. Sigma Tau Gamma received this award due to the strides the chapter made in new membership recruitment, finance, academics and social functions. Students in Truman State University’s Health and Exercise Science (HES) major, have several options on campus when it comes to joining both a professional and service-based organization within their major. Among those options are: Phi Epsilon Kappa (PEK), national professional exercise science and health fraternity; Eta Sigma Gamma, national professional health education honorary; and the Student Public Health Association (SPHA), a student-run organization for health science students. Each of these three organizations utilizes service to meet the specific career and educational needs of its members. For Phi Epsilon Kappa, service takes on a new meaning this year, as the organization opens its doors to all HES students interested in participating in its many service events throughout the year. Among the events that PEK plans to support through community service efforts are street clean-ups, Red Cross blood drives, the Alpha Sigma Gamma Breast Cancer Awareness Week, the NEMO Triathlon, Iron Dogs weightlifting meets and the Truman Homecoming 5K run. Phi Epsilon Kappa will be holding its recruitment/new member season during the spring 2007 semester. For this semester, all meetings, event and service opportunities are open to any HES student. Contact Megan Hasse, Phi Epsilon Kappa president, at mkh137@truman.edu for more information. Eta Sigma Gamma, a national professional health education honorary, uses long-term education/legislative, media advocacy/intervention programs and communitywide and statewide initiatives to promote its purposes of teaching, research and service through the health education field. Some of the year-round/on-going events that members of Eta Sigma Gamma participate in include: Health Educators for Court-Placement Students at Bruce Normile Juvenile Justice Center; MDHSS-Certified Smoking Cessation Instructors for Adults and Youth; Missouri State-Certified Long-Term Care Ombudsmen; and the Arthritis Foundation (AF) Exercise Program Instructors. For more information about events that Eta Sigma Gamma participates in, or for information about how to join, contact Carol Cox at ccox@truman.edu. The Student Public Health Association (SPHA), designed for health science students to come together to increase their presence in the public health field through service and educational activities both on and off campus, has seen its mission grow to encompass several community service projects throughout the year. The Student Public Health Association (SPHA) is currently involved in the following service activities: mental health awareness, Adopt-a-Street project, stream clean-up, Health Science book exchange, Adair County Family YMCA Health and Fitness Day, Stress Free Fridays, smoking cessation and Sleep Awareness Week. Contact Katy Parker at klp906@truman.edu, for more information about upcoming SPHA service projects, or to find out information about how to join the SPHA. Another option for health science majors to participate in community service events is through Truman’s unique service-learning program. Service-learning allows health science majors the opportunity to participate in community service projects that are directly related to their academic courses. Students enrolled in certain health science classes are eligible to participate in the service events. Examples of service-learning in which health science major at Truman have engaged in include: teaching Self-Care sessions to Truman students and members of the community; stream clean-ups, street clean-ups, and assistance at the Truman Recycling Center; and an 11-County Rural Health Needs Assessment Survey for Northeast Missouri. Truman State University’s Blue Key and Cardinal Key societies will be hosting the first University blood drive of the semester from 10:30 a.m. to 5:30 p.m. Sept. 13 and 14 in the Student Union Building Activities Room. The Red Cross will be signing up walk-up donations on both Sept. 13 and 14. Contact Paul Rotert, Blue Key blood drive chair, at pbr512@truman.edu for more information. The Office of the Vice President for Academic Affairs is now accepting nominations for the Walker and Doris Allen Fellowship for Faculty Excellence. The Allens established the Fellowship with one of the largest outright gifts ever made to the Truman State University Foundation. The $10,000 Walker and Doris Allen Fellowships recognize outstanding faculty members who have made exemplary contributions to the success of the University and its students. Up to three faculty members are selected each year. The Fellowships are open to all tenured or tenure-track faculty who have completed at least four years of full-time service at Truman. Eligible faculty may be nominated for the Fellowship by Truman faculty, colleagues, academic divisions or disciplines. To nominate an eligible faculty member, send a letter of nomination to the Office of the Vice President for Academic Affairs, addressed to the Allen Fellowship Selection Committee. The letter of nomination should be no longer than one page, and should address how you believe the nominated faculty member fulfills the selection criteria. Nomination letters must be signed, and a hardcopy of the letter can be delivered to McClain Hall 203, sent through campus mail or faxed to 785.7460. Log on to http://www.truman.edu/pages/125.asp for details, including the selection criteria. Nominations are due to the Office of the Vice President for Academic Affairs by Sept. 29. The Hispanic American Leadership Organization (HALO), the Muticultural Affairs Center (MAC) and multicultural service/social sorority Sigma Lambda Gamma, announced this week that Sept. 15-Oct. 15 will be Hispanic Heritage Month at Truman State University. Hispanic Heritage Month will see a variety of events on campus that are meant to raise awareness for Hispanic heritage. HALO and MAC sponsor a Spicy First Sunday Dinner at 5 p.m. Sept. 24 in the Ryle Hall Main Lounge. Following that up is the movie “Mojados: Through the Night,” sponsored by Sigma Lambda Gamma and HALO, at 8 p.m. Sept. 28 in Violette Hall 1000. October has three events scheduled, beginning with a dinner and discussion of film with special guest John Fraire, associate vice president for enrollment management, at 8 p.m. Oct. 3 in the West Campus Suites Main Lounge. The event is sponsored by Sigma Lambda Gamma and MAC. A Latin dance fiesta, sponsored by HALO and MAC will take place from 8:30 p.m. to midnight Oct. 6 in the West Campus Suites Main Lounge. A Latin band will perform. 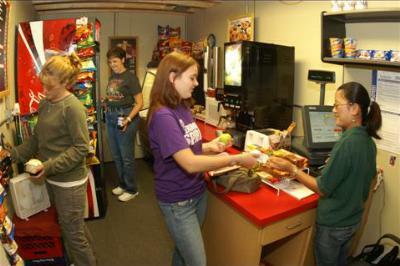 A student purchases a snack item from the new convenience store located inside Kirk Building. Sodexho recently opened a new convenience store located in the southwest corner of Kirk Building. The store is open from 7 a.m. to 6 p.m. Monday-Friday. The store offers items such as microwaveable sandwiches and burritos, soft drinks, candy bars, bagels, fruit and snacks. Eric LeCompte, national outreach coordinator of the School of the Americas WATCH, will be leading discussion about the role of torture, or threat of torture, in American foreign policy particularly as it relates to our presence in Latin America. Contact The Center for Teaching and Learning at ctl@truman.edu or by phone at 785.4391 for more information. The Writing Center is located in McClain Hall 303. If you have made any changes in your course schedule(s) since you submitted your graduation application and have not yet updated your application with the Registrar’s Office, you need to do so immediately. Updates can be made in the Registrar’s Office, McClain Hall 104, Monday through Friday between 8 a.m.-5 p.m. You do not need to complete a new application. To remain on the graduation list, all changes to your degree plan and all required substitutions must be on file in the Registrar’s Office no later than Sept. 29. All performances are at 7:30 p.m. in Baldwin Auditorium. Free tickets will be available for students, faculty and staff about one week prior to each performance. Contact the Public Relations Office at 785.4016 or log on to http://lyceum.truman.edu for more information. Detours magazine is sponsoring a photo contest for amateur photographers. The winning picture will appear in the Winter 2007 issue of the magazine. Entries should be appropriate to a professional travel magazine. There is no entry fee. Submissions (digital or film) should be sent to detours@truman.edu, or to Detours magazine, 100 E. Normal St., Kirksville, Mo. 63501. Two scholarships for $200 are available to Truman students from the Student Alumni Association. Application or further information can be obtained from the Web site http://saa.truman.edu or pick up an application in person at the Office of Advancement, McClain Hall 100. The application deadline is 5 p.m. Oct. 9 in the Office of Advancement or e-mail your application to SAA@truman.edu. Join Curt Devan and Matt Moore as they present changes made to the University’s Modified Supplemental Retirement Plan, and how these changes may affect retirements occurring by Dec. 31, 2009. Rotaract Club has open meetings at 7 p.m. Wednesdays in Baldwin Hall 284. Contact Brynn Weimer at bew935@truman.edu for more information about the film series or joining Rotaract Club. Entry forms may be picked up at the Student Recreation Center (IM bulletin board) and are available online. Entry forms must have name, banner ID number and signature of each participant. Entry forms are to be deposited in the metal box located at the Member Services Desk in the Student Recreation Center by 11 p.m. of the posted due date. Captains' meetings will take place at the Student Recreation Center Conference Room. All intramural rules posted in the handbook are applicable with every sport/event. Each participant is responsible for reviewing Student Recreation Center guidelines and intramural guidelines available on the Web site before any participating in any event/sport. *Dates are subject to change upon discretion of director, please utilize the Web site http://recreation.truman.edu for the most current information. Joseph Baumann, a senior English major from St. Charles, Mo., member of social fraternity Pi Kappa Phi, was named a Pi Kappa Phi scholar, the highest academic award an individual member of Pi Kappa Phi can earn, is given to between five and seven students each year. Recipients of this distinction receive a $1,000 grant toward their higher education-related costs. Mark Spitzer, assistant professor of English, recently had his short story “Gar Fever” accepted for publication in Ecotone. The 2005-2006 Echo yearbooks are now available for pick up from the Echo office, located in the lower level of the Student Union Building. Yearbooks are available free of charge to students, faculty and staff. For a $5 shipping and handling charge, a book may be shipped to a specified address. The Women's Club Volleyball team will have tryouts from 4-5:30 p.m. Sept. 12 at the Student Recreation Center. Callbacks will take place from 4-7 p.m. Sept. 13 with a 30-45 minute break for dinner. Students may e-mail Emilie Baugh at erb952@truman.edu if they are unable to attend tryouts on Sept. 12, but they must be able to attend Sept. 13. Sierra Club will have a meeting at 6:30 p.m. Sept. 12 in Violette Hall 1400. Contact Stella Costello at kcc358@truman.edu for more information. Tau Lambda Sigma will have a recruitment meeting at 7 p.m. Sept. 12 in Magruder Hall 2050. Tau Lambda Sigma is a service sorority. Recruitment will take place at 7 p.m. Sept. 12-15. Contact Kristen Overson at kao933@truman.edu for more information. DEPThS will have a meeting from 8-10 p.m. Sept. 12 in Baldwin Hall 249. Contact Dan Johnson at dmj736@truman.edu for more information. Sherry Dare, the Teaching and Learning Technology specialist, will be offering a Blackboard Workshop from 10:30-11:30 a.m. Sept. 13 in McClain Hall 215. This workshop will help instructors start building Blackboard course sites. Contact Dare at sdare@truman.edu for more information. The Weekly Lunch Series for faculty and teaching staff will have a session from 12:30-1:30 p.m. Sept. 13 in the Student Union Building Alumni Room. Dereck Daschke, Marc Rice and Linda Seidel will share what they learned and the action plan they developed at the 2006 CUR Institute on Mentorship, Collaboration and Undergraduate Research in the Social Sciences and Humanities. Sign the sheet at checkout to receive up to $3.00 toward your Sodexho meal. Rotaract Club, an international service organization, will be having an informational meeting at 7 p.m. Sept. 13 in Baldwin Hall 284. Contact Lauren Durand at lnd221@truman.edu for more information. Alpha Phi Omega will have rush interest meetings at 8 p.m. Sept. 13 in Violette Hall 1010, and at 8:30 p.m. Sept. 14 in the Baldwin Hall Little Theatre. Alpha Phi Omega is a coed, national service fraternity. Contact Jason Hanser at jth532@truman.edu for more information. The Freethinkers Society will have an immigration discussion from 8:30-11:30 p.m. Sept. 13 in Baldwin Hall 346. Everyone is welcome to attend. Contact Jessica Pautler at jcp936@truman.edu for more information. The Liberal Studies Roundtable Series will meet from noon-1 p.m. Sept. 14 in Pickler Memorial Library 205. The series is sponsored by the Undergraduate Council to give colleagues a chance to discuss curriculum issues. R.S.V.P. to the Center for Teaching and Learning at ctl@truman.edu or by phone at 785.4391 to order a complimentary boxed lunch for the event. The Next STEP will have a student workshop from 5:30-7 p.m. Sept. 14 in Magruder Hall 1090. Jason Miller, Next STEP program director, and other students who are new to Truman will have an interactive discussion about how the transition to Truman is going and what can be done to make it better. Dinner will be served starting at 5:15 p.m. Contact Jennifer Thompson at 785.7252 for more information. The Truman Optimist Club will have a meeting at 7 p.m. Sept. 14 in Baldwin Hall 251. The Truman Optimist Club is an organization that helps the youth of the Kirksville community. Contact Steve Pennington at 785.4211 for more information. The French Film Series begins the semester by showing “The Beat That My Heart Skipped” at 7 p.m. Sept. 14 at the Downtown Cinema 8. This film presentation is free to Truman students and faculty. All films are in French dialogue with English subtitles. The first 100 people will receive free popcorn and soda. Contact Tim Farley at tfarley@truman.edu for more information. Sigma Chi Delta will have an informational meeting from 7-8 p.m. Sept. 14 in Baldwin Auditorium. All women interested in joining local social sorority Sigma Chi Delta should plan to attend the event. Recruitment will occur Sept. 18-20. Contact Brianna Lennon, Sigma Chi Delta recruitment co-chair, at briannalennon@yahoo.com for more information. The High Street Dancers will be having a tryout workshop from 8-10 p.m. Sept. 14 and 15 in the Pershing Small Gym. Students wishing to tryout for the High Street Dancers must attend all workshops in order to learn the routines. The tryouts will be from 9 a.m. to noon Sept. 16 in the Pershing Small Gym. All dancers who participated in the High Street Dancers workshops and wish to tryout for the team must pay a $3 tryout fee.Contact High Street Dancers adviser Melody Jennings at 785.7259 or at jennings@truman.edu for more information. Diane Janick-Buckner will present “The Truman Shoot Apical Meristem Project: A Collaborative Effort Between Biology and Computer Science Faculty and Students” from 12:30-1:20 p.m. Sept. 15 in Magruder Hall 2001. This is the first session of the fall 2006 Biology Seminar Series. Jon Gering will be the host. Refreshments will be served at 12:15 p.m. All interested people are welcome to attend. Phi Beta Lambda, a professional, coed business fraternity, will have its informational meetings at 8 p.m. Sept. 18 in the Baldwin Hall Little Theatre and at 8 p.m. Sept. 19 in the Student Union Building Conference Room (301). Phi Beta Lambda is open to all majors. Contact Molly Smith at mks052@truman.edu for more information. The 14th Annual McNair Research Presentation is from 9 a.m. to 4 p.m. Sept. 27 in Violette Hall 1000. There will be a luncheon from noon-1:30 p.m. in the SUB Lounge. Please R.S.V.P. for the luncheon by Sept. 19 to the McNair Office at 785.5393. Alpha Phi Sigma will have an interest meeting from 7-8 p.m. Sept. 19 in Pershing Building 233. Alpha Phi Sigma is a national coed honor fraternity for justice systems majors and minors. Contact Jill Scognamiglio at jns832@truman.edu for more information. Echo Yearbook will have an interest meeting from 7-8 p.m. Sept. 19 in Ophelia Parrish 2121. Contact Erin Hickman at 785.4450 or at emh838@truman.edu for more information. Alpha Sigma Gamma will have its fall rush at 7:30 p.m. Sept. 19, 20 and 21 in the Student Union Building Activities Room. Alpha Sigma Gamma is a service sorority. Contact Julia Redford at jmr336@truman.edu for more information. “Definitions of Folklore” a colloquium of folklore discussing what constitutes folklore will be from 5-7 p.m. Sept. 20 in Baldwin Hall 272B. Using fan communities as a focus, Jack Holcomb, a Truman alumnus, and current professor at the University of Missouri-Columbia, will discuss his thoughts on the definitions of folklore. Contact Betsy Delmonico at bdelmoni@truman.edu for more information. Pickler Memorial Library is now accepting donations for a book sale to take place Sept. 20-22. Donations of used books, magazines, art prints and audio and video recordings will be accepted. For details visit the library’s Web site at http://library.truman.edu/booksale.htm or call 785.4038. Campus deadline for 2007-2008 Fulbright Grants for Graduate Study, Research or Teaching Assistantships abroad is Sept. 29. Contact Maria C. Di Stefano, Fulbright program adviser at mdistefa@truman.edu for more information. Omicron Delta Kappa will sponsor a peer-advising barbecue from 5:30-6:30 p.m. Oct. 4 on the Quad. The event will provide an opportunity for younger students to seek the advice of older students in their major. All majors will be represented. Food will be provided. Contact Erin Clark at eac903@truman.edu for more information.